Research from the University of Virginia suggests argumentative, rude teens who pressure others to side may “grow up” to be argumentative, rude adults. More disturbing, these rude-teens-turned-rude-adults report high levels of communication and high levels of satisfaction in their relationships in spite of friends and romantic partners describing them as “impossible to get along with” or “impossible to talk to.” As rude teens, they developed “relationship blindness.” As adults, they remained “blind” to the impact of their negative behaviors on the people around them and their relationships with them. They do not pick up on social cues that allow them to adjust their behavior, to modify it from rude to polite, pushy to accepting, argumentative to cooperative. And, if there is one thing worse than a rude, argumentative teen, it’s a rude, argumentative adult who doesn’t even know how rude and argumentative they are! None of us want our teens to grow up into a rude adult with “relationship blindness.” So, how do we make sure our teen’s normal argumentative behavior does not develop into relationship blindness leading to life as an argumentative, rude, and pushy adult? First, and most important, model a better alternative. When you disagree with your spouse, model respect. Listen intently. Speak politely. Allow your spouse to influence you instead of stubbornly insisting he or she agree with you. Do the same with your peers. And, don’t forget to do the same with your teen. Listen tenaciously to understand your teen’s point of view. Remain polite toward your teen, even in the face of their seeming apathy. Look for areas of agreement. Even allow your teen’s point of view to influence you. Our teens learn best by watching us. So live the behavior you want to see in them. Model, model, model…and model again. 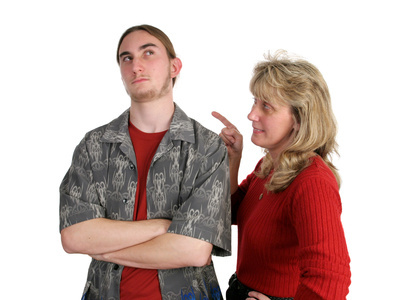 Third, talk with your teens about how rude, argumentative behavior impacts other people and relationships. Point it out in movies or sitcoms. Don’t overdo it. Just nonchalantly point out the impact of a character’s rude behavior and then go on to other aspects of the show. If they want to talk about the rude behavior, follow their lead. Otherwise, let it go. You can also use real life examples—examples from your own life or their life. Just don’t do it in a rude, argumentative way. Simply point out people’s response to polite behavior versus rude behavior. Point out the results of truly listening and responding to differences of opinion as opposed to constant arguing. Discuss the results of pushy behavior compared to the results of cooperative behavior. Fourth, model a better alternative. Oh, wait. Did I already say this? Sorry. It’s worth saying it one more time though. Model the life you want your children to live!